We’d love your help. Let us know what’s wrong with this preview of In a Heartbeat by Loretta Ellsworth. For fans of Gabrielle Zevin and Lurlene McDaniel, In a Heartbeat explores the ties of family and the weight of regret when a mistake costs Eagan her life during a figure-skating competition. Left in the afterlife, reflecting on what she could have done differently, Eagan's still-beating heart is given to Amelia who has been waiting patiently for a transplant. When their th For fans of Gabrielle Zevin and Lurlene McDaniel, In a Heartbeat explores the ties of family and the weight of regret when a mistake costs Eagan her life during a figure-skating competition. Left in the afterlife, reflecting on what she could have done differently, Eagan's still-beating heart is given to Amelia who has been waiting patiently for a transplant. When their thought, feelings, and dreams begin to mysteriously overlap, Amelia knows she must search for Eagan's family and find a way to give them all the closure they need move on. To ask other readers questions about In a Heartbeat, please sign up. Why does the story start out with Eagan? I think it should have started with Amelia the one who had the heart problem. my question is was Amelia born with the heart problem or did she get it somehow? Adrianne Snyder She developed it 6 years ago. in the story. no she was not born with it. I wonderd the same thing too! In a Heartbeat is the story of two girls and one heart. Eagan, bold and serious, is an up and coming figure skater with lots of promise. Shy Amelia has a sick heart and little time left to live—unless she gets a transplant. When Eagan falls at a competition (darn that Lutz! ), hits her head on the boards, and dies, her decision to check the organ donor box on her newly-acquired driver’s license brings Amelia a second chance at life. But the gift comes with its own challenges. Amelia takes on some In a Heartbeat is the story of two girls and one heart. Eagan, bold and serious, is an up and coming figure skater with lots of promise. Shy Amelia has a sick heart and little time left to live—unless she gets a transplant. When Eagan falls at a competition (darn that Lutz! ), hits her head on the boards, and dies, her decision to check the organ donor box on her newly-acquired driver’s license brings Amelia a second chance at life. But the gift comes with its own challenges. Amelia takes on some of Eagan’s personality traits, such as a sassy mouth and a partiality for the color purple. Spookiest of all, Amelia seems to know things she can’t possibly know: her donor was a girl and she liked purple lollipops, and she was an athlete…a skater. Soon Amelia is on a journey to meet the family of her donor. Meanwhile, Eagan is dwelling in an “in between place,” reliving moments from her life, whether happy or sad. She has a lot to sort out, from her rocky relationship with her mother to why she had always planned for the worst. Can she reconcile and move on? And can Amelia learn to accept her gift? I didn’t read the author’s note until I was finished with the narrative, but I could feel the real grief, and then later, the relief of someone who lost a loved one searching for solace in knowing a part of that loss lives on. Reading the last few chapters, especially, gave me tons of chills. It felt real. I don’t know how much of this phenomenon is scientifically sound, gaining the characteristics, cravings, etc., of one’s donor. But I kind of like the idea. It’s very…comforting, in a way. This review has been hidden because it contains spoilers. To view it, click here. Very nicely pieced together, we follow Eagan and Amelia through a meaningful and extraordinary tale about two young girls experiencing both the good and the bad affects that death leaves behind, all because of one beating heart. Eagan has just died after she hit her head at a skating competition, and the reader follows her post-death experience as she is given the chance to look back at her life, every single detail still in place, from her fifth birthday to her last meal with her fami Very nicely pieced together, we follow Eagan and Amelia through a meaningful and extraordinary tale about two young girls experiencing both the good and the bad affects that death leaves behind, all because of one beating heart. Eagan has just died after she hit her head at a skating competition, and the reader follows her post-death experience as she is given the chance to look back at her life, every single detail still in place, from her fifth birthday to her last meal with her family (her personal Last Supper, as Eagan put it). Amelia has been sick for six years and has finally had a heart transplant. In her half, her and a new friend Ari (by the end, boyfriend) are trying to figure out who Amelia's heart donor was. They eventually figure out that the donor is Eagan and attempt to meet with her family. This was one of those books that I stayed up until three in the morning reading. I really liked both sides of the story, especially the characters interactions and relationships with each other. I especially liked the Amelia + Ari side story. Well, the Eagan + Scott story was cute, too. But that ended more sadly (obviously, she's kind of dead). Eagan's reflections kept me reading, so did Amelia's effort to meet Eagan's family. What I really liked was that I could relate to these girls. It was very realistic. For example, I have a little brother whom I'm always annoyed with, just like Amelia. There was this quote, something like, "How can I die if I haven't even said goodbye to my little brother?" That made me think. It was a sad moment, it was. It made me feel guilty. I guess all in all, the plot + character reactions made me like it the story. For the first, like, ten chapters, Amelia always seems to start out saying how her heart doesn't seem to fit right, and Eagan always starts out saying how gray and transparent and blank everything is in the place she goes after she dies. It was really repetitive to the point where it got annoying, like, "Okay, we get it, everything here is gray. What do you expect me to do about it?" However, they did stop repeating themselves after a while, which I really appreciated (duh). Nothing else bad, really. When I got this book, I wasn’t sure how I would like it. But the synopsis got me interested and I picked this book up. When I began reading, I was introduced to two girls, Eagan, the figure skater, and Amelia, the girl who needs a new heart. In a Heartbeat began a story that I came to love. I’ve read a lot of Lurlene McDanilel’s books about heart transplants and the effects on the person who got the transplant. I loved how Loretta Ellsworth told both sides of the story, the patient and the deceas When I got this book, I wasn’t sure how I would like it. But the synopsis got me interested and I picked this book up. When I began reading, I was introduced to two girls, Eagan, the figure skater, and Amelia, the girl who needs a new heart. In a Heartbeat began a story that I came to love. I’ve read a lot of Lurlene McDanilel’s books about heart transplants and the effects on the person who got the transplant. I loved how Loretta Ellsworth told both sides of the story, the patient and the deceased. The plot was well thought out and there was research behind it. The plot moved at the perfect pace, slow and steady. Since the plot was so well thought up, I could really feel all the emotions that were supposed to be felt: scared with Amelia when she learns of her heat, Eagan’s confusion, Amelia’s tiredness, Eagan’s anger and so much more. There wasn’t too much emotion or too little of it. Which brings me to the characters. Ellsworth had great protagonists. Amelia was scared, fragile, yet so determined to live with her new heart. She knew the outcomes if the transplant went wrong yet she stayed strong. When she gets her transplant, Amelia learns to be grateful for the life she was given. Eagan is frustrated with her mother and anxious about her skating. When she dies, she is confused and though it takes a while for her to admit, scared. Both girls come out as strong (well, Eagan moves on), young women by the end of the book. They accept the events and circumstance for what and who they are. Eagan accidentally dies in a very unusual way while figure skating. After her death Eagan is stuck between the afterlife and the life she can't seem to leave behind. Her tale is of her past, the unsaid words, the people she loved that she'd left behind, and the events in her life that shaped her. Unable to let go of her life and the people she left behind Eagan spends most of the book trying to find her way back to those memories and people she left behind. Amelia is dying of heart failure. She i Eagan accidentally dies in a very unusual way while figure skating. After her death Eagan is stuck between the afterlife and the life she can't seem to leave behind. Her tale is of her past, the unsaid words, the people she loved that she'd left behind, and the events in her life that shaped her. Unable to let go of her life and the people she left behind Eagan spends most of the book trying to find her way back to those memories and people she left behind. Amelia is dying of heart failure. She is torn between wanting to live, and knowing that living means the death of someone else. Once she does get the heart transplant she desperate needs Amelia finds herself acting and being different. Where she was once shy and introverted she is now sarcastic and out going. The changes in herself causes Amelia to want to learn about her new heart, and the person that owned it before. Amelia's story follows her need to find the donor's family and bring some sense of closure, and to learn more about her. Wow, I wanted to literally shake Amelia. I was so infuriated with her extreme passive-aggressive attitude at the beginning of the book. She gets the call for a new heart and while her mother is running around trying to get her to the hospital for the surgery Amelia is sitting around in her bedroom picking her toes, looking at horse pictures, and playing cards with her brother. I know that the author was trying to show that Amelia is guilt-ridden from the fact that her donor has to die to give her a heart, but I was ready to just slap her. Hurry up! Do you really want to die? I kept thinking. Move it! "I'm so happy for you, Amelia. Mom has been praying nonstop." I wanted to get caught up in her happiness. Rachel made it sound like I'd won the lottery. The lottery of recylced hearts, and I was a lucky winner. "I'm not ready," I confessed. "I'm not ready for this operation. I don't want to go, Rachel." I knew I sounded like a coward and a crybaby. Eagan on the other hand---seriously how do you even say this girls name---I could totally relate to. Unsure of her life, fighting with her mother, dealing with the strange concept of knowing what you want. I got her immediately. I don't know what this says about me, but Eagan was me when I was in high school. Sans the parents with a troubled marriage. When she dies she realizes that there were so many things left unsaid, most especially towards her mother. Eagan cannot leave to the great beyond until she is able to find peace in the life she left behind. This character I didn't want shake, and I think we can all understand this feeling of unfinished business. If you died today what would you leave behind? Eagan is left in limbo, and it isn't until she finds another girl that she starts to understand that she needs to move on. She's looking straight at me. A girl. She stands out because she's not pasty gray like everything around her. Like me. She's wearing a frilly dress the same shade as the marigold bushes in Mom's garden. Her black curly hair is glittery. It reminds me of the stuff we put on our hair before competitions. "Can you see me?" I ask. She nods and waves like she wants to come over but needs to be invited. Finally. Someone to talk to. My heart feels lighter. Maybe she can help me find my way back to my life. She doesn't need more of an invitation. She's next to me in a flash. This book had an interesting concept both in Eagan needing to find peace after her death, and in the changes that occur in Amelia once she acquires a new heart. Unfortunately, while other readers of this book on the tour had mentioned how powerful and heartbreaking it was I felt it was simply good. Interesting premise, characters that evoked a reaction with me (good or bad), but it also felt like it could have been two books. I believe simply focusing on Amelia and her story then writing a companion book for Eagan could have given Ellsworth the ability to really spotlight and flesh out these two girls. In this case the dual narrative just didn't work for me. I had a hard time separating the fantasy elements from what I think Ellsworth was really wanting to focus on, the concept of cellular memory. I was a little unsure of what to think of In a Heartbeat as I started the book. Immediately you are thrown into a duel narration between Eagan and Amelia. My main worry was that I would have no connection to Eagan since she was already dead. However, I have to give major props to Ellsworth because by the end of the book I was very sad to see Eagan go. Going back through her memories and final days really allowed me to see whom she was. It was bittersweet in a way because on one had you’re glad t I was a little unsure of what to think of In a Heartbeat as I started the book. Immediately you are thrown into a duel narration between Eagan and Amelia. My main worry was that I would have no connection to Eagan since she was already dead. However, I have to give major props to Ellsworth because by the end of the book I was very sad to see Eagan go. Going back through her memories and final days really allowed me to see whom she was. It was bittersweet in a way because on one had you’re glad that Amelia has a true chance at life, but sad to see Eagan’s cut so short. My only real complaint is that wrap-up felt a little too easy and fast. I think had there been just a little more to the story Ellsworth could had let the characters and plot develop a hair more and even out the pacing. 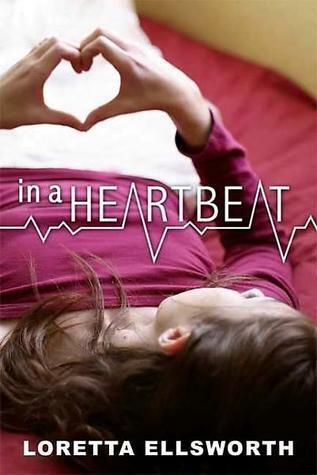 Overall, though, I did enjoy reading In a Heartbeat and would easily recommend this books to others. *for those parents who are conscious of spiritual matters, this book may cause some tension. Since Eagan's limbo conflicts will most belief systems. In a Heartbeat is about two girls, Amelia and Eagan. Amelia and Eagan don't know each other, but a mistake of half an inch cost Eagan her life. Amelia has a heart problem and is getting a heart transplant. She got Eagan's heart and is getting strange feelings from Eagan, who is trapped by her stress. Can they save each other? I liked this book a lot, but I didn't really like Eagan's mom's personality. Even though I didn't like they way she acted sometimes, I know without her personality, the book In a Heartbeat is about two girls, Amelia and Eagan. Amelia and Eagan don't know each other, but a mistake of half an inch cost Eagan her life. Amelia has a heart problem and is getting a heart transplant. She got Eagan's heart and is getting strange feelings from Eagan, who is trapped by her stress. Can they save each other? I really liked this book. I couldn't put it down. I also got a little teared up from a couple of parts. I really liked the way the author told two stories but put into one book. She split the two stories up. The first chapter was talking about Eagan. The second one was talking about Amelia and it just kept going like that. One thing I didn't was that the author didn't make me feel like I was there with them. She didn't us describing words like most books do. Overall I did really like this book. This was a quick but somewhat deep book. I really enjoyed it. And would actually give it a 4.5 stars. It's a story about a teenage girl, Eagan, who is a figure skater, and she's going places in her sport. But she can't seem to shake this feeling that something bad is going to happen. Well one day it does, she dies. One life is taken and another one gets a beating chance though when her heart goes to another teenager in need. From the moment Amelia wakes up from her transplant surgery she feels th This was a quick but somewhat deep book. I really enjoyed it. And would actually give it a 4.5 stars. From the moment Amelia wakes up from her transplant surgery she feels that somethings different. She keeps saying her heart feels like it doesn't fit right. She starts having dreams, and through these dreams she "meets" her donor. Eagan has been figure-skating practically since she could walk, and she's good. Really good. It's just not feasible that she could ever hurt herself while skating. But she does. Coming down from a triple axel, Eagan lands too close to the boards, smacking her head. Amelia has lived the past few years of her life quietly, without moving much or making too much of a fuss about anything. Amelia has a heart defect, and needs a transplant. One morning, she gets a phone call. The hospital has a heart f Eagan has been figure-skating practically since she could walk, and she's good. Really good. It's just not feasible that she could ever hurt herself while skating. But she does. Coming down from a triple axel, Eagan lands too close to the boards, smacking her head. Amelia has lived the past few years of her life quietly, without moving much or making too much of a fuss about anything. Amelia has a heart defect, and needs a transplant. One morning, she gets a phone call. The hospital has a heart for her. In A Heartbeat is a sad but exciting book. It's about two girls and one heart. Amelia needs a heart transplant, but has trouble finding one. The other girl is Eagan. Eagan is an ice skater that gets into an accident while ice skating. You don't really get a idea about Eagan at first, because she dies in the first couple of chapters. Later on, you find out about her past life and wish that she was still alive but atthe same time want Amelia to live. In a Heartbeat was a sad, rather heartwarming and charming story about a 14 year old girl who donates her heart to a girl who needs a heart transplant as a last chance. Amelia and Eagan are two girls who tell their story and save eachothers lives. Loretta Ellsworth is a charming author and I would read this heartwarming book again. Good realistic fiction that highlights two girls whose lives intersect when one loses her life and the other benefits through a heart transplant. After-life issues and discussion of cellular memory make this a read with some depth. It was creative and I haven't saw about like this topic. But it was kind of too easy or not impactive to the readers, and I could recognize the girl who appeared in the girl who was died was the sister of the skater girl. Anyway, this book made me to want to read this every night and every day. When I first bought this in the past which was in 2011, I was reluctant to read this book. Probably because I was young and had apphensive feelings regarding death. Even now, an acquaintance death affects me greatly but I'm glad I managed to go through with this book until the end. I actually made a random choice and groaned when this book was chosen but when I finally start, I didn't regret anything. It was probably just my fear getting in the way of me reading this book. This book doesn't talk When I first bought this in the past which was in 2011, I was reluctant to read this book. Probably because I was young and had apphensive feelings regarding death. Even now, an acquaintance death affects me greatly but I'm glad I managed to go through with this book until the end. I actually made a random choice and groaned when this book was chosen but when I finally start, I didn't regret anything. It was probably just my fear getting in the way of me reading this book. This book doesn't talk only about the heart transplant but also about coping with death. I dislike how such book needs boys to complete as if girls still need romance in regardless of their point of life. As if a beautiful romance is important and if you do not have it than you are no good. I think I'm too old for the book since I have begun thinking like that. Girls do not need any boys in their lives regardless of any point of their life. It's the only thing I'm not fond about of this book. Otherwise, everything about this book is beautiful. It was an easy read though subject was heavy, the flow of the plot wouldn't be too much to take. It is lovely in its own way. I was often pushed to the brink of tears but I didn't cry. I thought I won't but when I reach close to the end, the waterworks finally came. What a great read In a Heartbeat was. This was basically a story of two girls and one heart. I loved how the author told the story from both Amelia's and Eagan's points of view. Af first I wasn't sure about Eagan's narration since she was already dead, but the author did it well, and by the end I was sorry to see her go. Both girls were relatable and I thoroughly enjoyed following Amelia's story as she struggled to adjust to her new heart and the inexplicable changes that occurred after her opera What a great read In a Heartbeat was. This was basically a story of two girls and one heart. I loved how the author told the story from both Amelia's and Eagan's points of view. Af first I wasn't sure about Eagan's narration since she was already dead, but the author did it well, and by the end I was sorry to see her go. Both girls were relatable and I thoroughly enjoyed following Amelia's story as she struggled to adjust to her new heart and the inexplicable changes that occurred after her operation. Eagan's story was just as interesting as she slowly overcame her confusion, accepted her death and let go of the past. Told in alternating chapters, the more I read this book the more invested I became in the two girls and their lives. Amelia needs a heart. She doesn't know i she'll get one before her heart gives out. She's lived most of her young life avoiding activity, stress, and school. Eagan has always wanted to be an Olympic skater. She and her mom don't get along, but they both agree on her skating. Then tragedy strikes and Eagan dies in the middle of a competition. Now Amelia gets a new heart but she can't explain why she has a new craving for purpose, skating, and exercise in general. Told from both girls' points of vi Amelia needs a heart. She doesn't know i she'll get one before her heart gives out. She's lived most of her young life avoiding activity, stress, and school. Eagan has always wanted to be an Olympic skater. She and her mom don't get along, but they both agree on her skating. Then tragedy strikes and Eagan dies in the middle of a competition. Told from both girls' points of view, as Amelia adjusts to having a new heart and Eagan adjusts to her death. I have this on the shelf at school and wanted a quick read, so I could booktalk it to kiddos, to encourage them to check it out from the library. At the very beginning you are thrown into 2 narratives, Eagen and Amelia and it flips back and forth thru the entire book. A lot of my kiddos find this confusing, but I feel that if they stick with it, for a few chapters, they can keep it straight, as well as enjoy the book about 2 girls, 1 heart. Amelia needs a heart transplant, and Eagen dies in a freak ice skating accident and ends up being the donor that Amelia needs. When Eagan dies in an ice-skating accident, her heart is given to Amelia. After the transplant, Amelia starts taking on characteristics of Eagan which drives her to find Eagan's family to get the closure they all need to move on. I thought this was a very interesting book. It was weird and a little creepy when Amelia started taking on characteristics of Eagan, but it was an overall good book. Wow this book came to me at such a relevant time in my life! My cousin just passed away in March after a transplant rejection, so I have obsessively been thinking about the meaning of life and been researching organ donation like crazy. I also started up figure skating lessons, am a huge horse lover and I’m constantly drawing, so seriously this book consisted of everything I love. Don’t take anything for granted, especially your health and every beautiful day you’re alive! This story is about two girls, Amelia and eagan. One wrong move at the figure skating competition costed Eagan her life, but her heart was still going. Amelia had developed a heart problem witch almost killed her. Eagans heart had been donated to Amelia. "Amelia lived because eagan died". This book is so sad and interesting and I cried a lot and it's my favorite book ever! The author us so descriptive, and it's awesome! I wouldn't put this book down, it was so good! I write my own stories and read them to my family, and after reading it, it helped me write, and be more descriptive!